WARNING: In order to protect the pictures and the contributors, all HKPA pictures are not allowed to be sold or used for any other comercial uses. Welcome to Hong Kong Picture Archive(HKPA)! Hong Kong is also known as Pearl of the East. Our goal is to make available more pictures of this beautiful place, people and culture to people around the world. HKPA is a non-profit organization and all the pictures are submitted by many contributors around the world. Comic - This is a small section about the comics in Hong Kong. The drawing style of Hong Kong comics is a lot different from the western comics. Check this out and compare for yourself! 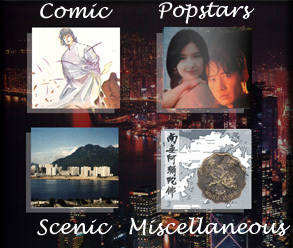 Popstars - This is our largest section which includes pictures of popstars in Hong Kong. It contains many beautiful faces of celebrities in Hong Kong. Scenic - This section contains scenic pictures of Hong Kong. The pictures are also categorized by the year they were taken. Miscellaneous - Pictures are placed in this section if they don't belong in any of the above 3 sections but yet still are related to Hong Kong. Please stop by our Infolink Center for other HK-related links and more information about HKPA.